Crop Reporting Board, Economics, Statistics, & Cooperatives Service, U.S. Department of Agriculture. Vols. prior to Jan. 1978 were issued by the Board subordinate to the Statistical Reporting Service; Jan. 1978- by the Board subordinate to the Economics, Statistics, & Cooperatives Service. 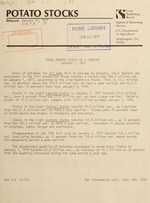 Description based on: Jan. 1979.
after the date of each report. AUGUST 1976 POT 6 (76). OF THE STATE IN WHICH THE POTATOES WERE PRODUCED. IN MAINE, MICHIGAN OR MINNESOTA. TOES ONLY. 4/ MICH, MINN, N OAK. RI STOCKS INCLUDED IN CONN.
NOT INCLUDED TO AVOID DISCLOSURE. in the same period a year earlier. VARIETAL INCLUDING B'S N02 CULLS : AFTER :WEIGHT.